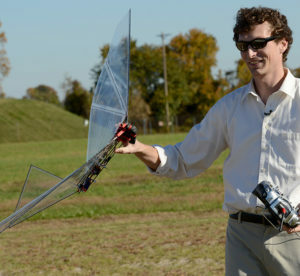 John W. Gerdes III, mechanical engineer at the Vehicle Technology Directorate, prepares to fly Robo-Raven at Aberdeen Proving Ground’s Spesutie Island Robotics Research Facility on Chesapeake Bay, Md., Nov. 3, 2015. 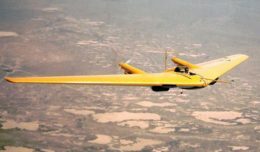 In the future, it’s possible that some unmanned aerial vehicles, or UAVs, might sport wings that flap like a bird or a butterfly. The Army Research Lab, or ARL, is testing that concept at the Spesutie Island Robotics Research Facility on Chesapeake Bay. John W. Gerdes III, mechanical engineer at the Vehicle Technology Directorate, has been testing such a UAV, known as Robo-Raven. He designed the vehicle in collaboration with the University of Maryland. During an open house Nov. 3, Gerdes took Robo-Raven for three test flights. He held it aloft in his hand, sort of like a falconer might do. With the other hand, he switched on the transmitter – the sort found in hobby shops for drones and toy vehicles. The wings started flapping immediately as soon as he threw it aloft. Up and away it went, flapping around in a light breeze more like a butterfly than a bird. A gust blew it backward, but Robo-Raven made course corrections on its own so that Gerdes continued to maintain nearly full control of its flight. After a minute or two, a curious raptor, possibly a hawk, circled Robo-Raven from above. At this point, Gerdes decided to land his mechanical bird. He raised his arm, and Robo-Raven obediently landed on his outstretched hand. Raptors, if given the chance, will destroy Robo-Raven, he said. Once in the past, he said he flew his bird up to about 300 feet and a falcon dive bombed it, destroying its gossamer wings. Once the falcon disappeared, Gerdes launched a second flight. This time, a flock of seagulls circled it. Gerdes noted that non-birds of prey will come over to investigate, but will not attack Robo-Raven – at least not yet. Unfortunately, Gerdes’ landing didn’t go as smoothly as the first and it crashed into the grass nearby. Fortunately, his half-pound bird sustained no damage. Observers wore hard hats and goggles, just to be safe. Had his Robo-Raven been destroyed in a crash or by a raptor, Gerdes had two backups, each of which looked similar, but were slightly different in shape and size for testing. The third flight went well and landed back in Gerdes’ hand. The challenge is to engineer a system, which can duplicate that behavior, he added. A quad-copter is great for flying at slow speeds, hovering, maneuvering and avoiding obstacles, he said. On the other hand, an airplane is great at flying high, far and fast. Animals that fly are able to do so because of an enormous number of muscles and nerves that control their flexible wing and body, he said. The slightest alteration of a wing can send a bird soaring hundreds of feet into the air on an updraft. On the other hand, Robo-Raven has some advantages over real birds. For instance, Robo-Raven doesn’t need to eat or reproduce. “Animals make sacrifices that are different that don’t make sense from a robotics standpoint, so it gives me hope that one day we can do better than an animal,” he said. Robo-Raven’s design is a terrible approach from an efficiency standpoint, Gerdes said. For one thing, it has two motors that independently control each wing. There are commercial flappy-bird designs that work more efficiently using just one motor to control both wings. For example, “you wouldn’t drive a car with a different motor on each wheel. You’d be carrying unnecessary extra weight,” he said. But from a scientific standpoint, this approach lets one learn a lot more about the platform and explore interesting spaces of the design, which wouldn’t be possible with a traditional flapping wing single-motor design, he said. With a single motor, one can only speed the wings up and slow them down, which doesn’t do much to inform learning of the system. Robo-Raven’s wings were designed with the help of ARL’s 3-D printer. Gerdes programmed a commercial-off-the-shelf Arduino micro-controller, which controls the flapping motion. A hobby shop transmitter and receiver is used to send and receive commands to Robo-Raven. It can fly for 10 to 15 minutes before the motors overheat. Inside Gerdes’ lab is a breadboard with wires connected to sensors. In about a month, he said he hopes to have a more robust Robo-Raven that can carry this full suite of sensors, which will measure altitude, air speed, wing position, flapping speed, power draw, battery charge, acceleration, roll and so on. These sensors will provide a huge body of data, he said, to begin to get at the “diabolically hard problem to solve” of flight similar to birds. Down the road, he said ARL might come up with an innovative flexible material that would boost the chance of bird-like flight. He said the various labs across the Army collaborate very well on projects like this and others are aware of what he’s doing. Ultimately in the future, Gerdes said he wants Soldiers to have a single platform that’s safer, quieter, stealthier, more versatile, that can do a wide range of missions. “It’s an exciting project, full of possibilities, but unfortunately right now, it’s not the finished product we’re after,” he said. That will be years from now. At that point, the U.S. Army Aviation and Missile Research, Development and Engineering Center might work on it.